IT project management is the biggest growth area for Foil Media. Over the years we've provided a wide range of clients with assistance in implementing IT solutions within their organizations with great success. We have established a reputation as astute, nimble and approachable IT consultants who can help make sense of a number of key IT challenges. We are increasingly turned to as a project management resource by a number of respected Ottawa agencies. We have strong relationships with trusted technical suppliers who partner with us on projects as required. 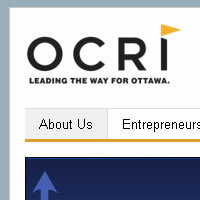 Leading the way for Ottawa, OCRI (known as Invest Ottawa as of late 2011) is the city's economic development agency. OCRI is the rallying point to bring business, research and talent together to create the winning economic conditions that allow Ottawa's knowledge-based companies to thrive locally and compete globally. OCRI promotes sustainable economic development to maintain the city's high quality of life. In 2011 Foil Media worked with OCRI on the development of a broad three-year IT plan for this dynamic and evolving organization. This process included a review of the organizaton's internal and external IT infrastructure and resourcing, and considered the best ways for OCRI to make optimum use of cloud-based computing and effectively address change management for the organization's approximately 60 staff members. For content management, we build custom CMS, use Adobe Contribute for some clients and WordPress for others.